Written in Roussillon during World War Two, while Samuel Beckett was hiding from the Gestapo, Watt was first published in 1953. Beckett acknowledged that this comic novel unlike any other 'has its place in the series' - those masterpieces running from Murphy to the Trilogy, Waiting for Godot and beyond. It shares their sense of a world in crisis, their profound awareness of the paradoxes of being, and their distrust of the rational universe. The new Faber edition offers for the first time a corrected text based on a scholarly appraisal of the manuscripts and textual history. Watt is at times extremely funny, bizarre, allusive and richly poetic. Though 'early' Beckett, the novel shows the author to be a remarkable virtuoso, investing plot and pace with classical, intellectual and earthy content style. 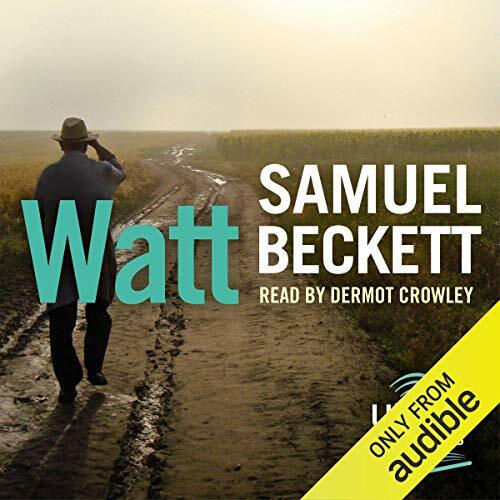 Dermot Crowley proves himself a towering Beckett performer, matching clarity with flair; and with its musical surprises (arranged and conducted by Roger Marsh), the recording shows that, once again, a key Becket novel comes to life unforgettably in the audiobook medium. If you could sum up Watt in three words, what would they be? A difficult novel to read made easy by listening to it. What other book might you compare Watt to, and why? Murphy and How It Is. They are all challenging books to read and these audio recordings really open out the text. I would like to hear some of Beckett's later novels and short prose on Audible. For instance Ill Seen Ill Said, Company, Worstward Ho! and The Lost Ones. The right friend, absolutely. The performance is a work of art in its own right, and the text is so difficult, it's almost a sport to see what the narrator's going to do with it. What he does is offer this much under-represented text arguably (by me) its best medium. Watt has some of Beckett's funniest writing, and there's a great sense of him working towards the inimitable trilogy. The performance here makes sense of the oceans of patterned text when you read it in hard copy, and Crowley brings fantastic light and shade to aid comprehension of the incomprehensible. Have you listened to any of Dermot Crowley’s other performances? How does this one compare? I listened to Dermot Crowley on Molloy, so I bought this one with confidence. His performance in Watt is comparable in excellence, but much more of a tour de force, because the text is even more difficult. He utterly brings it to life. No, I wanted to take it all in in 'movements' -- it evolves and develops in the manner of classical music. I'm so pleased to hear Crowley unleashed on Beckett again -- I'll certainly listen out for more from him. Listening to Watt is a dream come true for me. The book can be hard going but hearing it read makes life a lot easier. Dermit Crowley deserves some sort of prize for even trying, and he brings the difficult text to life perfectly. Apart from Waiting for Godot, this is probably the easiest Beckett to engage with (notwithstanding that it is in itself difficult) so if you ever wondered what Beckett is like, this could be a good place to start. Caution - parts of it will do your head in!